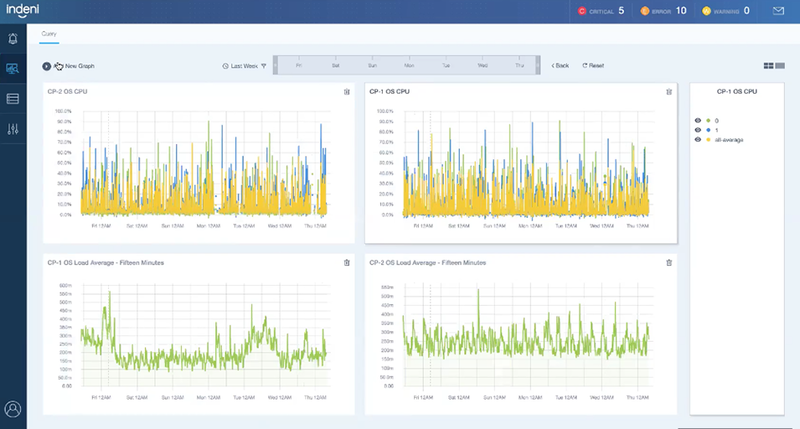 The Analysis Tab allows users to graph certain metrics over time, view historical values and correlate the data with issues raised by Indeni. Indeni collects data from network elements and it stores the data in a time series data store. A Time Series is a series of numeric data points of some particular metric over time. A Metric is any particular piece of data that you wish to track over time. For the purpose of graphing, it would only make sense to graph data that is numerical in value and the value changes over time. For example, CPU utilization, number of concurrent sessions, etc. This is the reason why only certain metrics are graphable. Indeni keeps up to a year’s worth of historical data! CP-2 is the standby gateway and CP-1 the active gateway. In this case, CP-2 is showing high CPU spikes that do not appear to be normal for a standby device that is idle for the most part. Next, you may want to add more metrics for correlation and further analysis. You can add load average, concurrent connections, memory usage, just to name a few. The analysis tab allows you to correlate multiple metrics across multiple devices.